Private View at Fosse Gallery: Sunday 6th March 2016, 11am – 4pm. The Exhibition continues until Saturday 26th March 2016. 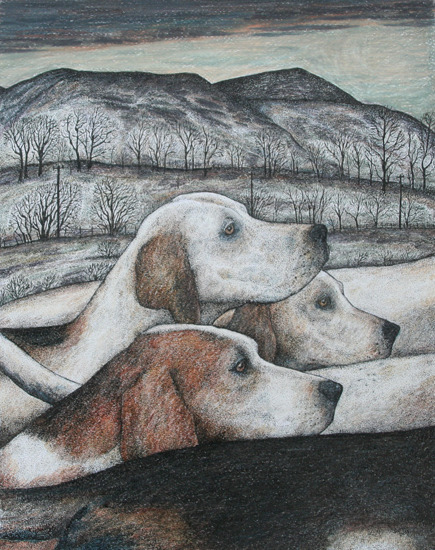 Seren Bell has established herself as one of the Fosse Gallery’s most charming and eagerly anticipated artists since we first exhibited her paintings in 2011. 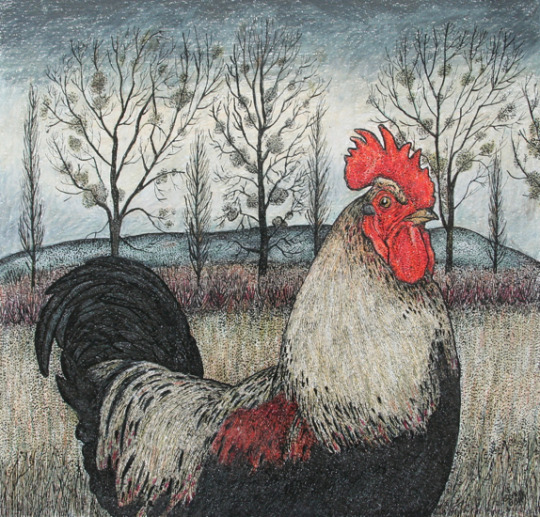 Working in crayon, pen and ink her second solo show with us is entitled the Rural Heritage of Mid Wales, inspired by the beautiful surroundings of the Upper Wye valley in Radnorshire where she lives. 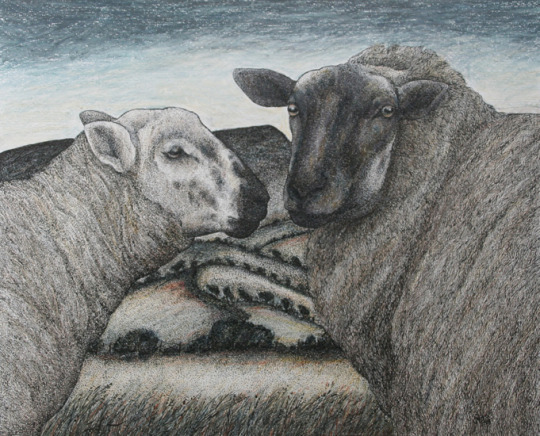 Described by Country Life as one of the most original animal artists in the UK, she is particularly outstanding at capturing the real essence of farm animals and especially, rare breeds of sheep and lambs. Already collected by HRH The Prince of Wales and the Duchess of Cornwall she has also been commissioned to paint some of the rare breeds owned by the Prince at Highgrove later on this year. Born in Tiverton, North Devon in 1950, Seren was educated at the local Grammar school and at Exeter University, graduating in 1986 with a BA (Hons) in English and Fine Art. Not long after that she returned to her family roots in Mid Wales—a move that would be very influential in her life. I am very lucky to be living in one of the most beautiful parts of Wales — the Wye Valley. Its hillsides are hung with ancient woods and lined with sheep tracks. Every day I walk with my dogs in this landscape and have come to love it in all its different moods and seasons. From the heights above the valley I can see the Black Mountains and the Brecon Beacons which have formed a backdrop to my life Seren explains. I enjoyed reading that she was besotted with the paintings of Samuel Palmer as a young student—as was I. Instantly you can see the parallels — they share the same intricate eye for detail and the painstaking application of technical expertise. But they both also allow nature to take pride of place as a glorious backdrop to their subjects, which they each handle with unassuming simplicity. Seren’s subjects — so often the sheep she loves — move us, in their stance or the dignity captured in their eyes as they huddle together. It is her innate ability, understanding and compassion for her subjects that define this work, make her stand apart and create a very special world indeed. There will be many stars in this exhibition, from ancient pigs to well-mannered hounds and flashy cockerels. Passionate about rare breeds last summer’s Three Counties Show provided Seren with irresistible subject matter. 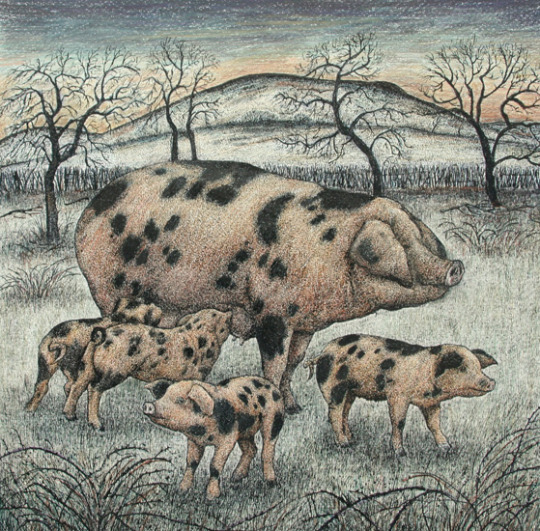 My work celebrates the rich and diverse variety of animals we have in this country. There are innumerable breeds of sheep, each variety developed to suit the countryside and terrain in which they are reared. Thanks to the work of enthusiasts today many of the rarest breeds have been saved for posterity, enthuses Seren—and their survival in all their glory this exhibition will most definitely celebrate.